The fourth Rhythm Changes conference,A?Jazz Utopia, will take place at Birmingham City University in the United Kingdom from 14 to 17 April 2016. We are delighted to have received well over 100 proposals from around 25 countries for papers, panels, and various creative events. Today we are meeting to evaluate abstracts. If you submitted one, you will hear from us very soon. And, thank you, by the way! Judging by the quality and range of abstracts, it”s going to be a great conference. 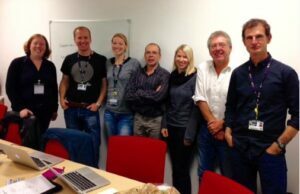 Here is the organising committee at BCU today, led by Dr Nick Gebhardt (right).